Con is admin dashboard based on Materialize framework, it is of the best responsive admin dashboard template 2015. 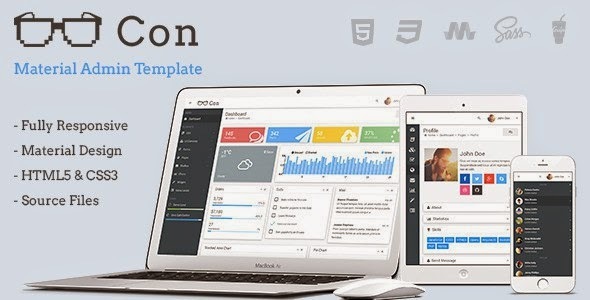 Template fully based on HTML5, CSS3 standards. Is fully responsive and clean on every device and every modern browser (IE9 and newer). Responsive: Con admin dashboard looks equally good on computers and mobile devices. Customizable: If you know how to work with Gulp, you can easily change the template source code. Change the main color, sizes, fonts, menus, etc. HTML code is divided into blocks – for example you can easily change the side navigation in one place and it will builds in all HTML files directly. You do not have to worry about cross-browser CSS. SASS and Autoprefixer will do it for you. Material Design: Con based on clean and modern design technique. Commented code: All code commented and all pages have code samples for each item or widget. Over 1300 icons: You can use FontAwesome, Material Design and Weather icons packs. Free updates and lifetime support. Item Reviewed: Con Material Admin Dashboard Template 2015 9 out of 10 based on 10 ratings. 9 user reviews.